Cut out the picture along the dotted lines (after you click the “Download Here” link above). Slip in some Power Munchies. 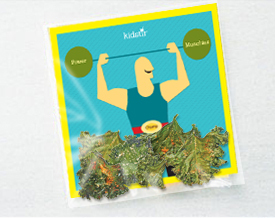 You’ll find our yummy Power Munchies recipe in the Kidstir Snack Happy Cooking Kit included in all Kidstir subscriptions. Once you make those, try our Carrot Chips! Our Energy Bites recipe is also great for a healthy snack. What if you’re in a hurry? Try our 5 tips for quick snacks! And don’t forget this great Butterfly Snack Mix. Happy snacking!